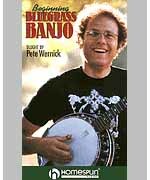 This DVD is perfect for those who have never touched a banjo before, but want to play the compelling sounds of bluegrass. ''Dr. Banjo'' teaches basic chords, right-hand rolls and great tunes such as: Buffalo Gals - Mama Don''t ''Low - Columbus Stockade - Shady Grove - Little Maggie - Lonesome Road Blues - Roll In My Sweet Baby''s Arms - and many others. 120-MINUTE DVD - INCLUDES TAB - LEVEL 1. Written in tablature, this straightforward, easy-to-understand method teaches rolls, chords, bluegrass banjo techniques, playing up the neck, licks, endings, and other basic information. Play-along CD and DVD features Janet Davis' teaching and lively banjo performance. .